Goodness me, the sun has just appeared! After what has felt like a very grey and dull week, I was so very grateful for the sun's appearance. I have otherwise been trying to inject some Spring colour into my week. A new baking book arrived. The couple of things I have made so far have been excellent. This is one book I can see getting lots of use, excited about this one! The perfect spot for a read has been in the sitting room. I am so enjoying this room, which of course was out of action for 38, YES 38, weeks last year! It's had a facelift and is a joy to cosy down in. 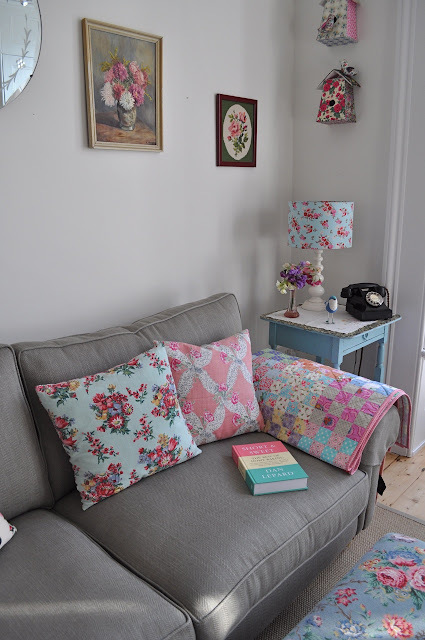 I've been enjoying sourcing thrifty prints, bits 'n' bobs, and fabrics for cushions. I did sort of borrow one item for the photos though. This is the latest quilt finish I have to share with you. I just really love this quilt. Really! So it seems, does Jacky Ginger! I guess everyone has their own taste and favourites but I think this is one of mine and I'm feeling quite giddy at letting it go. But that's ok, because it means I can make another, doesn't it? And I do love thinking that someone else out there would love this as much as I do. 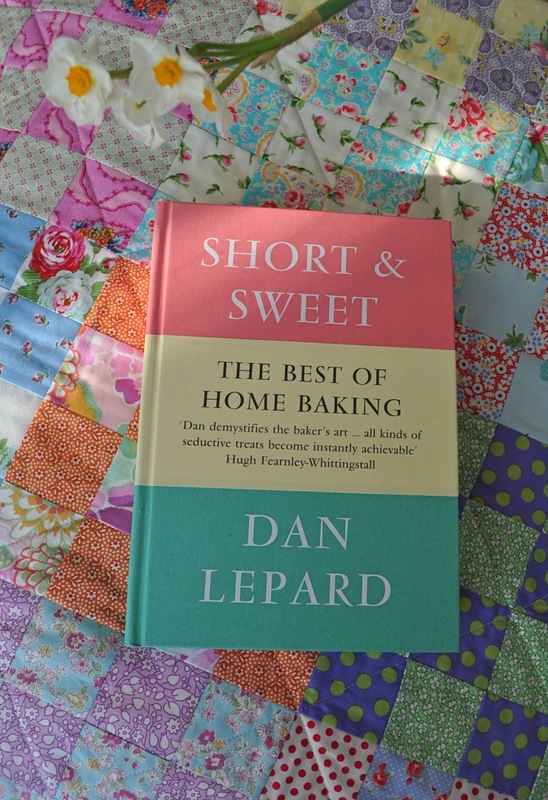 So should you fancy it, you will find this beauty patiently waiting in my blogshop. Another beauty made by your fair hand! 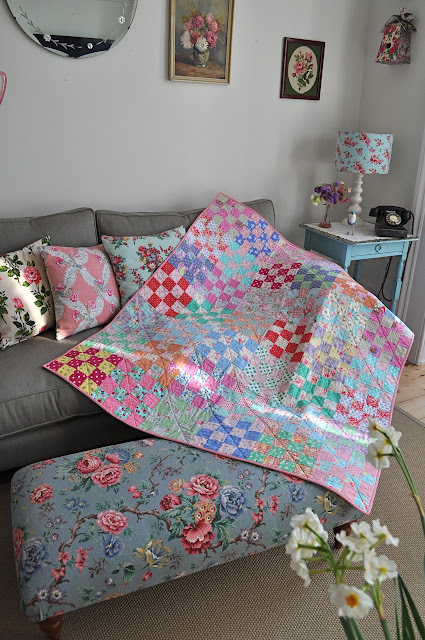 I love your quilt, makes me think of spring! Hi I absolutely adore your quilt! 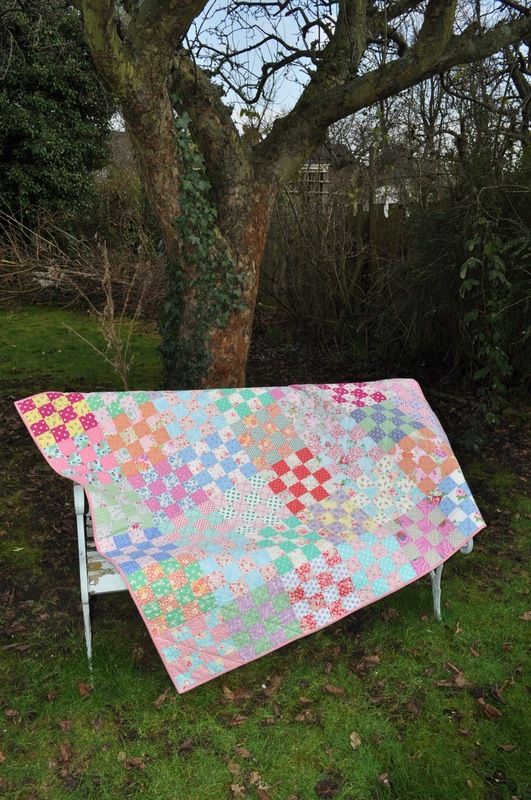 But first I have to finish my granny sq blanket and then - only then will I sit down to make a quilt! You and the other quilt bloggers have inspired me to make my own. Such pretty colours and that book looks yummy! Our cottage is so teeny we have no more room for indulgences, otherwise I would snap up your beautiful quilt. Whoever buys it is lucky! 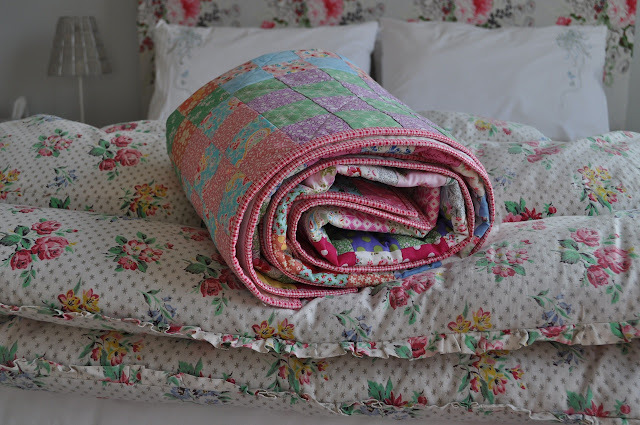 Such a beautiful quilt and I adore your room. So cozy and comfortable and bright and florally! Is that a word? Anyway, I just love it. our bedroom has just had a makeover and I'd forgotten just how much I love the feel of a "new" room- the different light, the different furnishings to find, things to place differently and fall in love with all over again! Such a pretty quilt, Hen....the pattern is gorgeous and your sweet vintage fabrics work so well. I love your new room too. 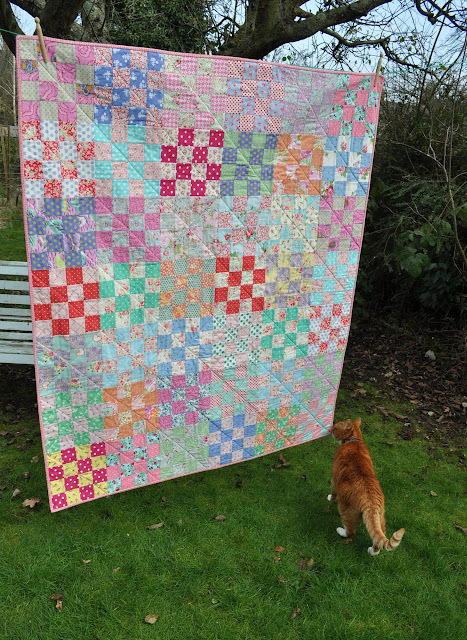 A beautiful quilt in gorgeous colours. V. nice quilt ( again) and it must be a joy to have your room back- as for the sunshine- couldn't believe it when the sun came out this afternoon! What a beauty,,,I'm sure it will be lovely snapped up soon! 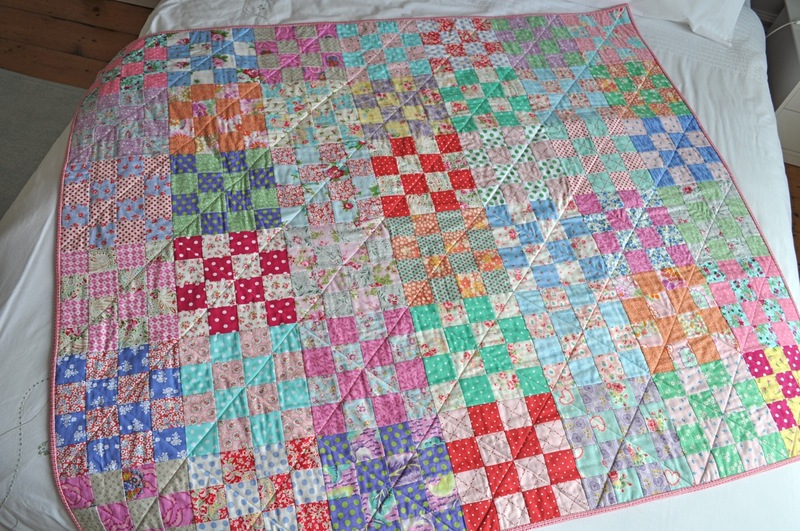 Another gorgeous quilt! I love this one very much. I enjoy seeing your sitting room too; I'm also looking for wall decor at the moment so I love seeing what you've chosen. Lovely quilt. I love everything. your house looks so pretty. the table next to your couch is nice the vintage painting from the flowers on your wall are so great. 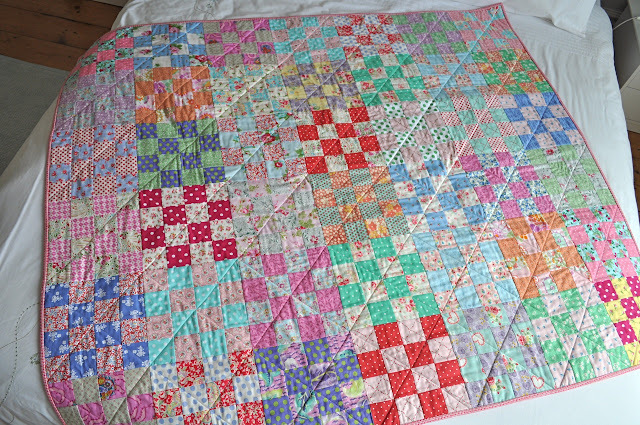 You are a very talented lady Mrs Hen, your quilt is lovely. Hope you get lots of sun and warmth soon. We are almost ready for the rain to return - almost. Beautiful! My kind of quilt. You did a fabulous job! You really have a touch!!!! I just adore your colors and style... Everything you make is beautiful!!!!! Those colors and prints are fantastic!